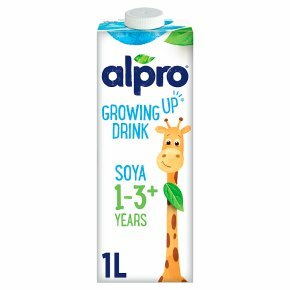 Soya drink for children from 1 year onwards, with added minerals and vitamins. Enjoyplant power. Low in sugars. 100% plant-based. Free from cow's milk protein. Free from colours and preservatives. Free from dairy and gluten. Suitable for vegans.Now in Handy Size Busy & On-the-Go? Try our smaller packs. For growing up milk* *For normal growth Calcium, vitamin D and Protein is needed for normal growth and development of bone in children. Iodine contributes to the normal growth of children. For the brain Iron contributes to normal cognitive development of children. Nutritionally tailored as a main drink for children 1 year onwards. Can be served hot or cold and used in all cooking applications as an alternative to milk.